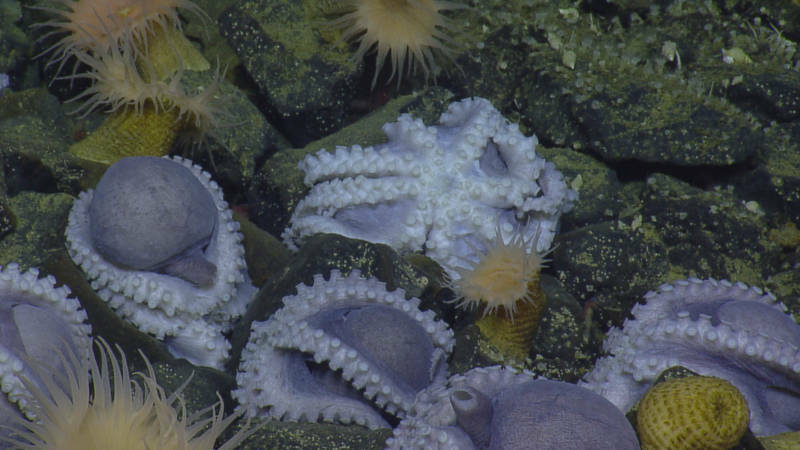 But before I digress too far, the cool bit of marine science-y news is that scientists have just spotted a huge amassment of octopuses watching over their eggs. These brooding cephlapods adopted an inverted protective posture with tentacles facing outward. This observation was made at the Davidson Sea Mount, which was subsumed into the Monterey Bay National Marine Sanctuary in 2008. Interestingly, this is only the second time such an aggregation has been observed, but this recent discovery comes only a short time after work published about a smaller example of the phenomenon spotted in Costa Rica most likely involving the same genus. Other interesting observations of octopus behavior have also been observed off the Monterey Bay area including an example of a deep sea octopus who brooded over her eggs for four years. A week and half ago multiple science news outlets reported on the publication of a study that described a new species of Geckolepis geckos, a bizarre genus that goes by the more common moniker of “fish-scale” geckos. They appear to be relatively unique to the Comoros Islands and Madagascar, locations that harbor other fascinating endemic species (restricted to a certain region), a fact which can largely be attributed to island isolation. This quality of Genus Geckolepis to lose then regenerate scales is suggested to have applications in human medicine with regards to tissue recovery. In addition, geckos have been studied for other enviable qualities including their ability to adhere to vertical surfaces with ease. A new species of Bonnethead has been described in Belize by FIU researcher Demian Chapman, thus the scenario of a single widespread species in that region now becomes the story of one or more species with overlapping ranges. The discovery was made after analyzing a snippet of the shark’s genome. DNA analysis has allowed a much more nuanced perspective on species-level differences beyond the physical characteristics that were once the focus of classically-trained taxonomists. Now scientists are able to classify variance on a genetic level and have refined the technique. Now researchers use a method called DNA barcoding, which needs to examine just a small portion of an animal’s genomic sequence, and is often compared to scanning groceries at your supermarket’s checkout line. Large-scale efforts to catalog and archive these genetic identifiers, such as Barcode of Life, make this data widely accessible. 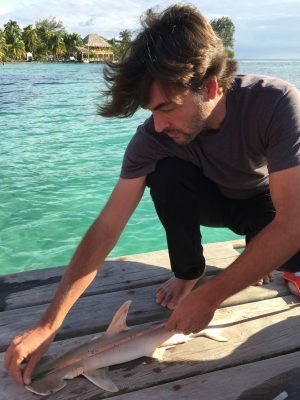 In addition, this finding was part of a larger initiative, called Finprint, focused on filling in data gaps concerning sharks, fins, and rays – all of which constitute a group of cartilaginous fish known as elasmobranchs. Finprint uses baited remote underwater video (BRUV) as one of their primary tools for studying these creatures. Much of their work appears to be focused on their spatial distribution, identifying regions that could lead to conflict with other uses such as fishing or areas that can be marked as candidates for protection. Many of nature’s means of doing business on land has aquatic parallels. Seagrasses produce seeds and pollen the same way as terrestrial grasses do. However, there are certainly some differences. The pollen grains of seagrasses dwarf their land-based counterparts at almost 50 times larger, and the physics of the water in which pollination occurs certainly follows rules vastly different than those air currents. Scientists have been postulating for some time about how marine plants get the job done in such a different environment, evident in this 1976 abstract for a submission in Letters to Nature. Many aquatic plants may reproduce by variations of self-cloning where a sexual partner is not needed to give rise to new individuals. Sea grasses often dabble in a little of both worlds, as both have their evolutionary advantages. Cloning, often referred to more specifically as vegetative propagation in plants, allows underwater flora to quickly take up real estate without expending as many resources. However, sexual reproduction confers the benefits of genetic variation and adaptability into their populations. Initially, it was suggested water bore the primary burden of transporting pollen grains from male to female seagrass plants. However, in 2009, a team of researchers from National Autonomous University of Mexico led by Brigitta van Tussenbroek observed small invertebrate crustaceans visiting turtlegrass (Thalassia testudinum) flowers in a manner that reminded them of terrestrial bees. To explore whether or not these small creatures had the capacity to truly serve as pollinators, they moved their exploration in the controlled setting of a laboratory. They put turtlegrass and pollinators in tanks sans current, and monitored the movement of pollen grains as well as successful instances of pollination. Both successfully occurred in tanks where crustaceans had been added, but not in tanks where the animals were absent. The research team coined a new term, zoobenthophilous pollination, to describe the marine process they observed. Seagrasses are vital to human wellbeing in ways similar to oyster reefs, coral reefs, and mangroves, and provide a wealth of services to the environments they thrive in. They are an important food source for manatees, dugongs, turtles, and other creatures. Their root systems stabilizes sea floors. They may serve as nursery grounds for minuscule juvenile fish needing protection from predators. But seagrasses have seen vast decline worldwide, in what could be called a global crisis. Now that we are learning seagrass survival may also have dependence on pollinators, we can only hope we do a better job of conserving these little sea bees than we have their terrestrial counterparts. Nature has a fickle way of removing the wheat from the chaff. When organisms are less suited to survival, their chances of lasting long enough to reproduce may be in serious jeopardy. If the deleterious traits are genetic in nature, then there is limited chance they will be handed off to future generations. We call this process natural selection. One example proving that humans can act as a shaping force similar to mother nature by chiseling the genetic outlook of a creature is presented in this recent Independent article.The piece describes how African elephants in some regions are being born with smaller tusks or entirely without them, presumably in response to the selective pressure of poaching. While there always have been an elephant here or there born without tusks, the preferential culling of ivory has increased the prevalence of tuskless elephants. However, as Snopes suggests (not a source I was expecting to comment on the issue), this particular phenomenon has been noted and written about for years prior. A 1995 paper published in the African Journal of Ecology noted in Queen Elizabeth National Park had jumped from 3-4% up to 9-25%. Collectively in South Luangwa National Park and nearby Lupande Game Management Area, the change was from 10% up to 38% in a 20 year period. While elephants may be the charismatic mascot for poaching issues, undoubtedly it is an issue that for a multitude of animal species reverberates well beyond just their population size and deeply into the very tapestry of their DNA. Several news outlets this week have justifiably made a big deal about the Greenland Shark. Recent research suggests these lumbering giants are now the record holder for the longest lived vertebrates we are aware of. This knocks the Bowhead whale from first place, whose age-determination story is fascinating in its own right, bolstered by the presence of an antique eskimo harpoon point. Often sharks have been aged through examining growth bands present in vertebrae, however Greenland sharks have softer vertebrae that make this challenging. Additionally, due to challenges in reading these rings as sharks age, as well as possible disconnects between growth rate and age, radiocarbon dating has been joining the toolbox for determining fish longevity. This study used the method with the sharks’ eye lenses. These sharks may take up to 150 years to reach sexual maturity, making their population vulnerable if too many individuals are culled before reproducing. They are also bizarrely prone to parasitism by a strangely-elongate copepod (most look more shrimp or lobster-like) that attaches to their eyeball and ultimately causes a march towards blindness. Only 1% of the 1500 sharks in a study concerning infection rates were parasite-free. 85% are afflicted in both eyes. However, due to their reliance on a keen sense of smell, rather than sight, for hunting, it has been suggested that the sharks may actually benefit from the copepod acting as small visible lures that interest nearby prey. However, Dr. George Benz of Middle Tennessee State University with expertise in shark and ray parasites, doubts this theory, instead favoring the idea that Greenland sharks may instead be ambush hunters, taking their targets instead through the element of surprise. Lest you think National Geographic is losing their edge, the reason why ctenophores (the phylum to which comb jellies belong) defecating is a big deal is because it was thought this group of creatures had a single opening for both feeding and excreting. University of Miami researcher William Brown debuted videos at the March 2016 Ctenopolooza gathering at the Whitney Lab in St. Augustine (where I’ve done much of my own dissertation field and lab work) that prove otherwise. One of the peculiar videos is featured partway through Nat Geo’s article here. Science writes about the find as well. One of the most interesting aspects of this find is questions regarding the evolutionary history of gut development. It was thought to be a pretty straight forward pathway from one opening to two. However, because comb jellies evolved before other organisms that still have a single opening, such as sponges, things are looking slightly more interesting. Perhaps ctenophores branched off, and smartly evolved a more complex gut tract independent of these organisms. Or, perhaps some of these single-orificed organisms started with two but lost one over time – similar to the story of some marine mammals that long ago left the sea to become land-dwellers, only to ultimately return again.